In March of 2000, Rio Nido ’67 leaked into circulation. I was a lucky early recipient of the show on CD and found myself compelled to review it almost immediately on the pages of Dead Net Central. Exuberant with not only the music, but with what this tape meant in the fabric of the Dead’s historical document, I sounded a bit like I had just returned from having had a religious experience while retreating on a commune somewhere. I suppose that was pretty much the case. Below is a slightly edited copy of that review. This is SERIOUS, folks. This show stands (for me) as the pinnacle example of the raw psychedelic power that emanated from the Dead in the early years. This show gives us a glimpse into the true heart of one of the greatest turning point years in the band’s history. 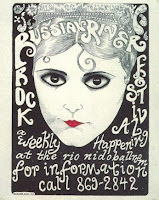 What 3/18/67 shows us of the bridge between 1966 and 1968, Rio Nido captures far more clearly. This show has completely flipped my wig. If you don’t have it yet, seek it out at all costs. This show is a classic beyond belief. This show makes me weep for all the other shows from this period that we’ve never heard, and may never still. I can hardly attempt to chronicle every song from this show. That won’t be necessary. You don’t even need to get more than three minutes into the opening Dancin’ In The Streets to realize what you have here. That puts you about 45 seconds into Jerry’s solo. He is solidly in that groove where he is seamlessly weaving rock, folk, Indian, and acid into his guitar playing. But instead of his reaching glimmers and moments of this, as he does so breathtakingly on 3/18/67, his solos on 9/3/67 are infused with this sense every step of the way. His note selection, tone, and amazing knack for getting caught in repetitive spiralings of phrases are uncanny. At this point Jerry has honed his love of Indian/Eastern tones and phrasing far beyond the greatness of 3/18/67. And when he adds in the bluegrass flavor, he becomes untouchable. All of this coalesces into the music’s overflowing ability to draw one into the present moment where there is little else but you and the music – a forced meditation fueled by 1967 psychedelic rock. Seeing this show (and really, this must be true for any of the shows we don’t have on tape from this stretch of 1967) must have been incredible. There could be no escape. No let down. No rest. I’ve always fancied that Jerry reached a God-like status on 3/18/67, and that anyone within earshot was destined to follow the band for the next 28 years. You can just sense the slack jawed expression on the faces of the audience as he ripped out his solo on The Same Thing and Viola Lee Blues. But it’s nothing compared to 9/3/67. The things that Jerry does, and Phil (oh my God! Phil!!!) go above and beyond. Let me try to explain a bit further. On the opening Dancin’ in the Streets, Jerry starts his solo off with some huge lines. He’s wasting no time. He’s bending and cooing notes all over the place. His fuzzy electric tone is warm and textured. The entire time, he is playing outside of a traditional blues/rock scale framework. He doesn’t just work himself out of the songs traditional feel, he is long gone from it the whole time. As he moves along, he rolls off the treble more and more, until his notes sing like morning birds lamenting summer’s departure. His ability to infuse Indian melodies with this tone is remarkable. While doing this, it’s almost unbelievable that they are playing Dancin’ in the Streets. His guitar sings soft and haunting songs that defy simple human expression. It’s as if he is only a conduit for the voice of the music. This continual overlapping of incredible lines goes on and on. Soon we find Jerry beginning to grab lines and attach them as a seamless circle, running them round and round upon themselves. Without a giant crescendo, and with no need for one really, things settle back down into the framework of the song, and it wraps up. You’re just left standing there in awe. The Viola Lee, which eventually turned up featured as an extra track on the official re-release of the debut album in the Golden Road box set, cuts in on the last words of the first verse, giving us the full ride between verses. Early on, you can tell this is something special as you are lost in the classic Viola Lee triplet riff that goes on forever and ever here. This one threatens to trip you because Phil is an evil jester, ending and restarting the triplet on ever note but number three. You can just feel him grinning the whole time. They converge back on the song with some trouble, but save the day by somehow gathering themselves on the right downbeat. It makes for a fantastic moment, and launches one of the pinnacle psychedelic passages in the Dead’s musical history. The solo section starts off in a typical grungy Viola Lee fashion. Shortly, though, Jerry gets himself locked on a little two note pull-off that grabs your attention. Then the band seems to focus more. Bobby is flinging little riffs all over. Phil is breaking ever rule of key and tempo with amazing success. Billy picks things up a bit, and they’re off to the races. Jerry adds some bluegrass, while Phil is still breaking rules. What is easy for the ear to pick up here is Cumberland Blues. Not as a hint or tease of the actual song, but as a groove. I’ve always drawn strong lines between Viola Lee and Cumberland all the way through 1973. Here, the country coal mine two step is nicely explored. Next time you listen to a Cumberland from 1970-1973, listen for the Viola Lee Blues. It’s in there. Just as this is getting comfortable, Jerry moves outside the box with a minor key and what follows is brief but remarkable. He’s playing lines that should belong to Chuck Berry, but only if you dosed Chuck to the gills. For a moment it’s just Jerry and Billy. Phil comes back in with tons of power. He is starting to let a few notes just grow on their own, until he’s feeding back a bit. Jerry overlays this with some sitar-like flavors (the morning birds lamenting again), and then everything stops except for Billy’s hi-hat. The Caution Jam comes in as if on cue. It is short-lived, but completely present. Jerry simply can’t be contained. He turns up the tone knob and kicks into gear. Phil is still working Caution, but Jerry is just nuts, going in and out of the Caution Jam time and time again. The beat is flying along. Now Jerry is caught in circular patterns again, while Phil is pulling notes up from underground. He (Phil) is demonstrating an amazing ability to expand the chord patterns of the song, until he’s completely playing noise. The rest of the band follows and they head into the traditional Viola Lee howling feedback section. A great time to forget the world around you and let the speeding waterfall of colors consume you. They bounce back to the Viola tune with their well-known precision. But, instead of heading to the last verse, they just let the jam develop all over again. Bobby is playing with a brute strength, crushing notes and chords in his path. Phil does a slow stair stepping of notes that is magnificent, pulling every last breath of harmony out of the song’s structure. 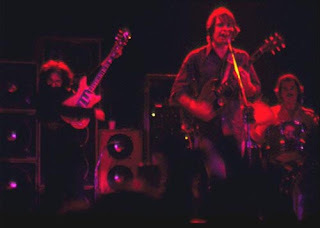 Just when you completely forget that the end of the song was coming, Jerry brings the beast under control and the last verse begins. Yes, the cut comes only seconds into the Feedback that would end the song, and it hurts. But, boy oh boy! We are blessed to have what we have. The Alligator is another great example of this 1967 power. Booby’s chords at the start are dynamite. The jam gives Bobby room to move too. He is playing loud and strong. 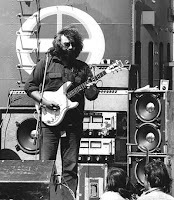 Jerry’s playing has time shifted a few months into the future, touching everything we would later hear from him in the early months of 1968. It’s no doubt that this song opened the doors of the next year. You can even hear hints of Jerry’s China Cat runs as he works in a Mountain Jam to the fabric of his Alligator solo. Then the Midnight Hour (officially released on Fallout From The Phil Zone) rounds out the set. An epic version, not only based on its length (31 minutes) but also for containing a tremendous Pigpen rap. My favorite bit comes while the entire song seems to moving along as nothing more than a groovy dance hall number, keeping people up on their feet and having a good time. But then the wind shifts and Jerry starts oozing notes with his volume knob, and a landscape of slow motion explosions and molten puddles of empty space fill the world before you. It passes as quickly as it comes, but leaves you nervous that things aren't quite as safe as you thought. 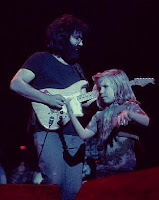 A great Grateful Dead moment. So much pleasure from a little over an hour and a half of music seems almost unfair; nearly as much so as the pain of all that missing music from 1967 overall. But, perhaps the former is elevated by the latter. Maybe the circumstances that lead our particular thread of a universe to bring us what music it did simply followed a familiar human adage among its fellow universes: One man gathers what another man spills. An equal blessing is that the band allows us to stream this entire show (officially released Viola Lee Blues and Midnight Hour included) on the archive. There are holy places along the 30 year journey that is the collection of Grateful Dead live recordings; shrines self-manifested by the music created on a particular night. I’ve referenced some of these moments as Grateful Dead satori – passages where you can’t help but “feel it” happening and become lost within the musical “now.” There are a number of these places tucked away here and there across the three decades of Dead music. They are, in large part, a driving factor in what makes the Grateful Dead something so special. It’s funny; you’d think in a blog like this one, the first task would be to list those moments out – just get down to it, maybe five or ten posts and we’re done. For whatever reason, the shows I’ve written about have assembled in a more organic, and unforced fashion. I stroll down memory lane, and get drawn this way or that; bounce from one idea or year to another. I’d say each show I’ve featured has that certain special something laced into the recording somewhere. Sometimes it is fleeting, sometimes it goes on for ten minutes. I knew I ought to spread things around a bit. 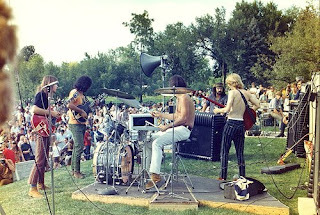 You’d all think I was crazy if I just posted about half a dozen 1973 shows out of the gate. I had really been away from the music for a number of years, so I’ve been revisiting it as I have been encouraging you to do, whether for the first time, or the first time in years. That the best of the best of the best have not turned out to be in the first group of posts is just how it has gone. Or maybe all the shows carry satori in some way, regardless of whether I hear it or not. Regardless, if I ever create a filter label called “Must-Hear Satori,” this show will go in it. I’ve had 06/24/70 sitting on a shelf staring at me from day one of this blog. I’ve seen it most every day. I hadn’t listened to the show in easily five years, maybe more. But I well know what’s in there. And it occurs to me that it represents one of the great blessings of this modern age of Dead tape trading: the master cassette transfer, in all its glory, is right there ready for any and everyone. You don’t have to hunt it down. You don’t have to score a crappy sounding cassette copy and curse the hiss. You don’t have to live through the years where we all wondered if we’d ever hear the actual master. The story of the usher tapes could fill a book. You can walk into this cathedral preserved perfectly for you. All the candles lit. The sun causing the stained glass to shine beautifully. You can be alone if you want. This is a holy place. At the same time, if you’ve been digging the Dead online for a while and didn’t know about this show, it points to the daunting nature of traversing this jungle of music without a map. It is that exact reason that I write this blog. It’s a crime not to have a Deadhead taper living down your block, as I mused over in post number one. Interestingly, I would have never sent you home on day one with this tape. Not only do you need to have at least a slightly AUD-tuned ear to fully grok this tape (you don’t want to be bitching and moaning about this not being a soundboard while listening), you might also do well to have built up a tolerance/appreciation for great Dead moments before launching yourself into this one. Too large a dose of something could have adverse affects if taken too early. 6/24/70 peaks the meter above the red zone. You need to have some semblance of that upper range to best appreciate this gold medal show. This Dark Star suite is something quite above and beyond your standard wonderful Dark Star. And this tape allows you to hear every pin drop, every flash pot go off (you’ll lose count), every ripple of deeply psychedelic energy fill the entire Cap Theatre to the rafters, washing the entire audience away into other dimensions. After the first verse, as the Space expands, there’s a guy in the audience sitting directly behind the right side microphone (they were spread 25-30 feet across the front of the balcony) who quietly mutters “Oh my GOD.” It’s a convergence of the gripping magic of the music, and the fact that it is being caught on tape, and that it survived for us to hear it. It becomes an instant preservation of what is was to be a guy at a psychedelic rock show in 1970. That guy’s comment drills home that certain something that we all ponder over when we think about what it was like to see the band back then, head fully fed, and locked in the embrace of the Grateful Dead. At this moment it is no wonder that people would travel the country, following this band for years. It’s also with the comments of this guy, who seems to be struggling to keep a grip on his connection to the physical world, that the holy satori moment has fully locked in. It will remain this way through to the end of I know You Rider. There is a subtle Attics tease early in the Space followed by growling, star exploding caverns of warped time, which all turns to liquid gold light coursing around you, gently shimmering into Attics of My Life. So sublime. So majestic. So haunting. The audience, which has been extremely vocal and excited all evening, has fallen away. It’s just you sitting on the center of the balcony rail with the Dead spread out before you. Mickey and Billy draw the edges of Space into the beginning of Attics, prolonging the pleasure of the transition even more. Attics, which had only been debuted a month earlier, and wouldn’t even be officially released on American Beauty until November of 1970, had to be a new experience for virtually everyone in the theater. It brings the entire audience to its collective knees. Dark Star comes back instantly and we are assuredly at the mercy of a masterful six headed story teller, weaving in and out of themes. Dark Star heads into a Tighten Up Jam, and there are audience members exploding out of their skin on the main floor. Screams and wailings can be heard way down below the loud, loud music. Each one drives that airborne energy deep into your heart, sucking you into the moment more and more – the core of what good audience tapes bring to the experience. It’s not the screams themselves, it’s the energy jumping off the tape. 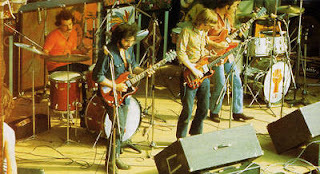 The jam finds its way briefly into a Feelin’ Groovy Jam, and then Jerry drives the group into Sugar Magnolia. Now, considering the train wreck that was the debut of this song on June 7th, it is a miracle that the song was ever played again this second time. But the tempo is much faster now, and while the song is still in its infancy (part of verse one and the refrain repeated), this version captures so much of the Grateful Dead “thing” from 1970, it’s wonderful. The unintentionally, or otherwise, syncopated “Knew she’d have to come up soon for air” line is breath taking perfection. The song segues into the triumphant Dark Star crescendo. More flash pots go off, and the second verse arrives. 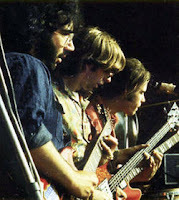 Coming out of the second verse, the song takes its well documented (Live Dead, 1969) transition into St. Stephen. The crowd feels it coming (our guy behind the right side mic *really* feels it coming), and the band delivers what is clearly the biggest hit tune for the East Coast fans at the time. Everyone knows this song, and loves that they are getting to hear it. The band manages to match, or outdo the LP version, and the powerful post “One man gathers what another man spills” section explodes, much like Pigpen’s gunshot that leads it off. This section of the song goes beyond description. It all about the unstoppable energy here. There are no solos. It’s this onslaught of musical intensity. It sends shivers up and down my spine every time I hear it; a smile involuntarily paints itself on my face. 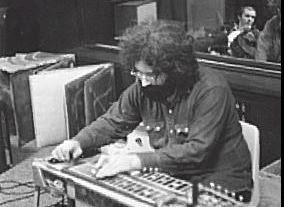 Jerry takes the band directly into China Cat Sunflower after St. Stephen, and again the power boils off the tape. Jerry soars. Bobby soars. Phil roars. You get the sense of the music playing the band here, much like you would in the best of some deep deep jamming. Here, within the structure of another Dead classic, the song reaches archetypical proportions and somehow transcends the individual band members themselves. A glorious country twang filled exit jam flows into I Know You Rider, Bobby’s solo spot on all the way through. The crowd is in rapture. Gleeful shouts and screams continue. While we aren’t deep within a Caution or Lovelight now, the satisfaction of the musical journey is not diminished in the least. This is the Dead writing the book on the mystical Americana folklore-rock experience. That the show doesn’t exist in the Dead’s soundboard vault makes it somehow even more folklore-ish - a part of the undercurrent and sub-culture. Jerry’s own wail that traditionally accompanied the segue into the song’s power chord ending in 1969-70 sounds as if he’s as overtaken by the music as is the crowd. We’re right there with him. No doubt, you may build a mental shrine for this recording yourself after it’s over. Sharing it with you points to an age old adage of Grateful Dead tape trading: It is most certainly as gratifying to share the music as it is to hear the music. I hope you find as much in this recording as I do. I have not veered into any of the Dead's side projects on this blog. But it stands to reason that some of Jerry solo work will eventually find a place here. For now, because we are talking about 6/24/70, it is as good a time as any to make sure you get yourself into some of Jerry’s *other* work with the New Riders of the Purple Sage - the psychedelic country outfit in which Jerry played pedal steel guitar from 1969 to late 1971. 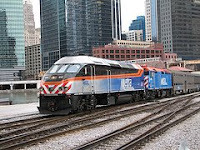 They opened for the Dead from May 1970 through the end of 1971, and when the 6/24/70 master made its way into circulation, the Riders sets did as well. The Riders sets are included in the links above. 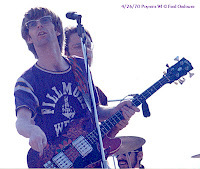 One of the nicest things about a 1970 Dead show was how long it was, and how much musical ground was covered. The acoustic set, followed by the Riders, then the electric Dead made for a massive spectrum of musical exploration. The Riders were never seen as some side act. They were a solid part of the Dead’s fabric. This evening’s recordings are ultra fine, and the musicianship is top shelf. 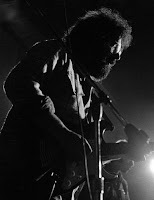 It’s great to listen to Jerry playing through all the incarnations of music, first on acoustic, then steel, then electric. I didn’t want to let my featuring this night’s show go by without making sure you got the Rider’s sets too. I love this stuff, have pretty much everything that circulates, and revisit this date often. Back in the day, this was perhaps the most difficult of the circulating June ‘76 shows to find. I say “of the circulating shows” because a few shows from this month sat in the “holy grail” bucket – ones you saw absolutely nowhere (6/4, and 6/27 among them). I had an admittedly charmed trading life back in the 90s, and one trade in particular brought me 05/07/70, 05/12/74, and 06/09/76 all in one box. I don’t remember the trader’s name, but it was a guy with the classic “everything,” and I went for stuff on his list I had seen nowhere else. I probably sent him my A quality 04/29/71 and the composite of Watkins Glen 07/28/73 that I seeded out for the 25th anniversary. God, that Watkins tape opened any door I wanted back then. More on that when I work up the review. That 06/09/76 was so hard to come by seems a cruel joke played on this year of Dead shows. As mentioned before, 1976 gets such a bad rap, and it is in no small part due to the fact that most of the best stuff imaginable from that year just never got into wide circulation. Now, not only does this AUD master circulate, but so does the SBD. I’m a firm believer that good AUDs from 1976 give off an energy that was often missing from soundboards from that year. That, and the purely nostalgic feelings I have for this tape lead me to talk about the AUD. The first set is no slouch, looking like a dream set that might have been penned by some fans in the parking lot before the show. Cold Rain opens. It was only played three times in ’73, and once in ’74 on the last night of the farewell stand at Winterland (it was the opener that night too). Cassidy was played only once before, early in 1974. And then we get Scarlet Begonias, Music Never Stopped, and Crazy Fingers, all in a row. Whew! But set two opens with the song that most fans probably didn’t even allow themselves to think about ever hearing again. The crowd’s reaction to St. Stephen is priceless stuff (equaled again upon its second return in 1983). The song’s jam demonstrates the 1976-typical slowly spinning kaleidoscope of sound right from the first notes. It swirls and swirls going further and further out – Jerry finding one beautiful space after another. They all key back together for the last verse as if they’ve been playing the tune every night since it was last played on 10/31/71. When they shift from “What would be the answer to the answer man?” into Eyes it is dreamy perfection. Is this really happening? You will be in the giddiest of Grateful Dead spaces here. This Eyes is perfectly described as jubilant. The super up tempo treatment of the song is pure pleasure. Also, it has another new 1976 twist: they build the song backwards with the long exit jam coming before the song itself. This one goes on for 8 minutes before the first verse, and it serves to prolong the giddy zone all the way through. Your dog might even start twirling around the living room to this song, his or her little puppy paws rising and falling like incense smoke overhead. Not good enough for you? Try refraining from joy as the band eases out of Eyes into a light and dreamlike mist that sounds bound perfectly for Wharf Rat, only to have Bobby magnificently draw out Let It Grow. It fades into view like a ghost out of the fog. Brilliant. The Let It Grow is overflowing with more of the wonderful interlocking spinning wheel glory of 1976. In and out of Drums on a dime. And then there’s this perfect little Brown Eyed Women. The song hardly ever gets a second thought when it comes to “best of” conversations. But, I’ve always found this one somehow a cut above. The quickened tempo has a lot to do with it, I’m sure. In many ways Supplication seems to define 1976. There was nothing like this happening pre-retirement at all, and it has a groove altogether new to the Dead's repertoire. The band stokes this fire nicely, but they don’t linger. That’s okay. Ounce for ounce, the Lazy Lightning>Supplication scores a 10 all the way through. Finally, the return of High Time (last played on 07/12/70!) ushers in some space to breath. Gotta love the guy sitting next to the taper bellowing out “Dark Star” in a heavy Bostonian accent before it too. Disco Dancin’. Many an old deadhead shudders at the thought of anything that happened after 1974. And the return of Dancin’ In The Streets in 1976, with its blatant nod to the disco beat of the times, is generally the first thing pointed to when marking the signs of the apocalypse. However one feels about it, 6/9 contains the third airing of the newly vamped version (debuted six days earlier after being shelved on 12/31/71). Still in its infancy, it’s mostly a group effort with no one taking center stage. This allows for lots of intricate play between the band members who are clearly listening closely to each other. They stumble and catch themselves nicely through the end themes, and Wharf Rat follows nicely, with Around & Around closing the set unsurprisingly, but the sizzling double tempo ending portion adds a welcome flair. The Franklin’s Tower encore is a good ride. It feels like a pretty standard delivery until Jerry starts exploding in the leads sections. The final solo passage builds to a climatic fervor before settling back down and allowing the song to end. A nice end to a great show.